Her name is because she has ruby red eyes. I did consider names relating to her short tail, but I realised it was undignified to do so, although I nickname her “Shorty” for the obvious reason . She was part of the 2007 litter raised by my friend Fred, there was eight in total, five Jills’ and three Hobs. 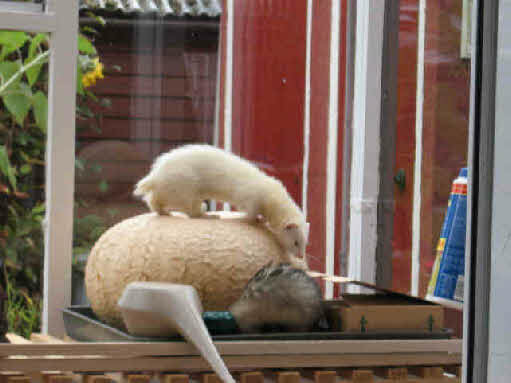 Not only is her tail short, but she is also the second deaf ferret I have owned, both have been albinos. She is very lively and friendly. Her cage mate is Lucy who is her opposite, except for the friendliness. Both exercise with Susie and Grace, whom they get along with, but for the odd squabble involving Ruby against Susie and Grace. Ruby top, Grace with her head in an old boot.